James Edgar Johnson was born at Barrow-upon-Soar, near Loughborough, Leicestershire on March 9 1915. He was educated at Loughborough School and Nottingham University, where in 1937 he qualified as a civil engineer. Aged 17, he bought a BSA 12-bore shotgun – for £1 down and nine similar monthly payments. Rabbits fetched a shilling each, and he reckoned that if he could average two rabbits from three shots he would pay for the gun. He became adept at deflection shooting on the ground and, graduating to wildfowling on the Lincolnshire marshes, adapted the skill to bring down widgeon, pintail and teal. “The principles of deflection shooting against wildfowl and aeroplanes,” he would reflect, “were exactly the same, except that aeroplanes could sometimes return your fire. The best fighter pilots were usually outdoor men who had shot game and wildfowl. 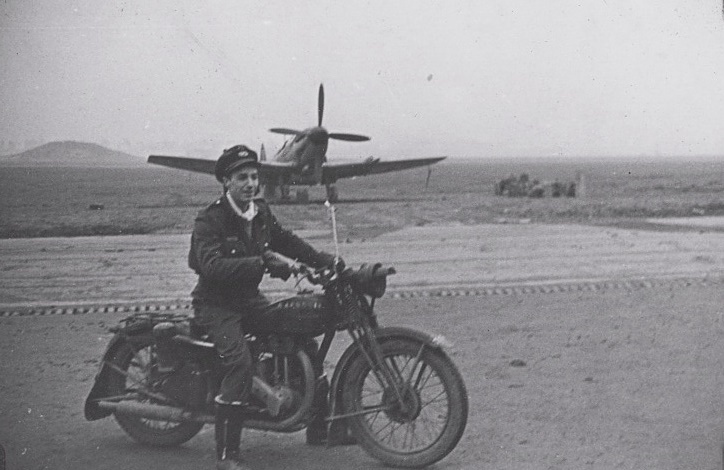 “Johnson also learned to ride at an early age, and he enjoyed his Yeomanry service – though after seeing Spitfires and Hurricanes on a visit, on horseback, to Wittering, he declared that he would “rather fight in one of those than on the back of this bloody horse”. Johnson accounted for at least 38 enemy aircraft over Britain and occupied Europe, yet his actual score was almost certainly higher. Of the many enemy aircraft he shot down, he waived shared credits to boost the scores – and the confidence – of younger pilots.He earned an appropriately impressive collection of decorations, including a DSO and two Bars and a DFC and Bar. This recognition contrasted starkly with the RAF’s refusal before the war to approve his application to join an Auxiliary Air Force (AuxAF) squadron, or to serve in the RAF Volunteer Reserve (RAFVR). It was only after Johnson had enlisted in the Leicestershire Yeomanry, TA, that the RAFVR reviewed his application and accepted him for pilot training. But for the delay, Johnson might well have been ready for action at the beginning of the Battle of Britain on July 10 1940. As it was, his late entry and a badly set collarbone fracture meant that he did not open his score until the New Year of 1941. 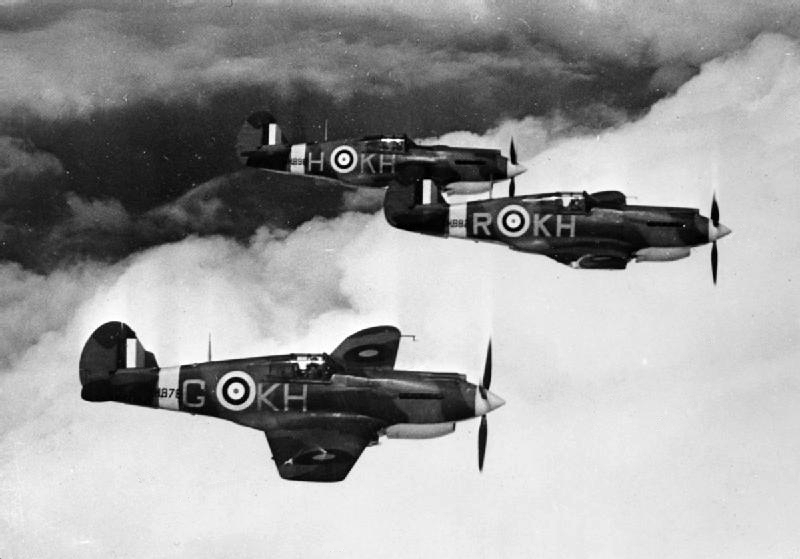 When, subsequently, in the summer of 1941, Fighter Command launched a series of aggressive cross-Channel sweeps, the airmanship and combat skills exhibited by Johnson as a member of No 616, South Yorkshire’s AuxAF Spitfire squadron, were recognised by Douglas Bader, then leading his celebrated Spitfire wing from Tangmere at the foot of the South Downs.Bader paid Johnson the compliment of inviting him to fly in his own section, and the two men struck up a lifelong friendship. 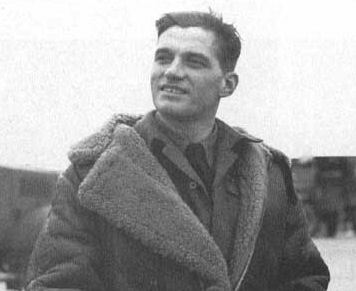 On August 9, during the wing’s operation in support of a bomber attack on Gosnay, near Lille, Johnson was present when the legless Bader was shot down and taken prisoner. Of that day, Johnson recalled how the amiable banter of his groundcrew relieved the tension as they strapped him in at Westhampnett airfield, a satellite of Tangmere. He remembered, too, how “the usual cockpit smell, that strange mixture of dope [varnish], fine mineral oil, gun oil and high octane assailing the nostrils” was “vaguely comforting”. He tightened his helmet strap, swung the rudder with his feet on the pedals, wiggled the stick, thought about Lille and Me 109s and switched on his gunsight. “In a slanting climb we cross Beachy Head and steer for the French coast. Bader rocks his wings, we level out for the climb, slide out of our tight formation and adopt wider battle formations at 25,000 ft.” Over the Pas de Calais, the wing encountered a swarm of Me 109s. “We fan out alongside Bader. There are four 109s with others on either side. Before opening fire I have a swift glance to either side. For the first time I see Bader in the air, firing at a 109. My 109 pulls into a steep climb, I hang on and knock a few pieces from his starboard wing. “Spotting a solitary Messerschmitt, Johnson dropped below, to take aim with his cannon at the unarmoured underside of the aircraft. Moments later a plume of thick black smoke marked the end of the 109. Following command of No 610, in March 1943 Johnson was posted to lead the Canadian fighter wing at Kenley. 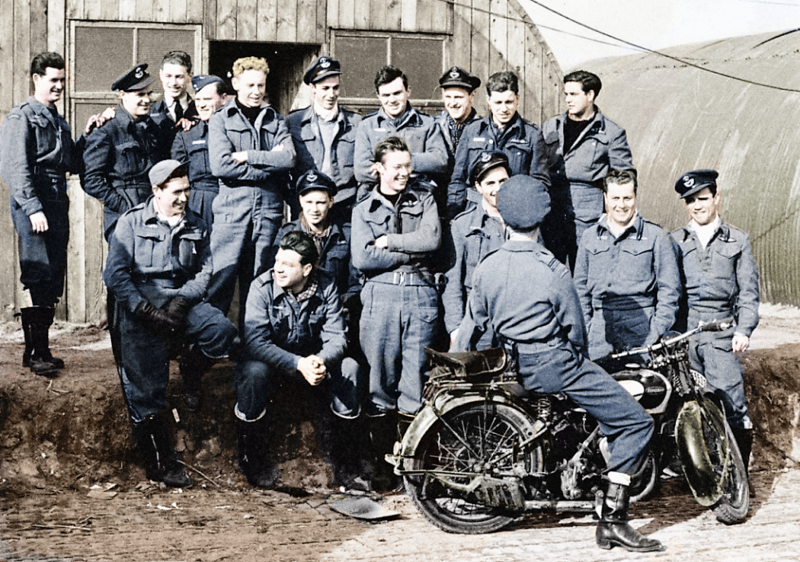 Before long, Syd Ford, commanding No 403 Squadron, laid a pair of blue Canadian shoulder flashes on Johnson’s desk. “The boys would like you to wear these,” said Ford. “After all, we’re a Canadian wing and we’ve got to convert you. Better start now. “Attacking ground targets and acting as escorts to US Eighth Air Force Fortress bomber formations, Johnson’s Canadians produced ever increasing scores – in addition to Johnson’s 14 kills and five shared between April and September. When Johnson left the squadron to rest from operations, his send-off party was such that the wing was stood down the next day. 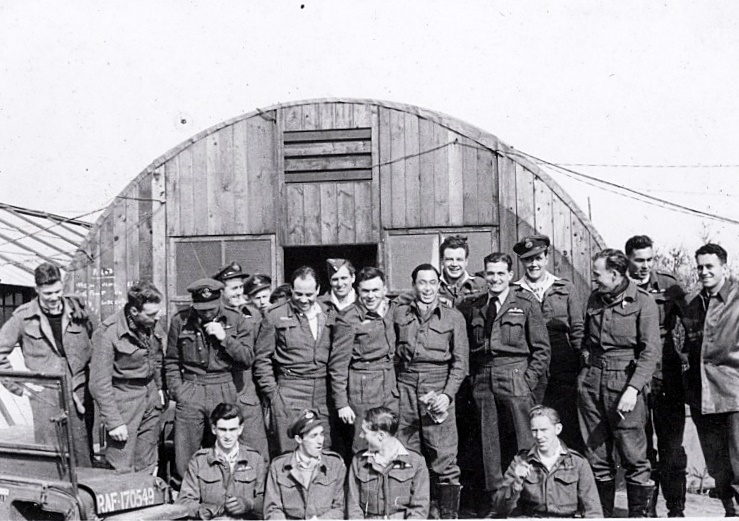 Such was Johnson’s reputation with the Canadians that when, early in 1944, the Royal Canadian Air Force formed No 144 Wing of three squadrons at Digby, in Lincolnshire, they insisted Johnson command it. At the D-Day landings on June 6 1944, Johnson led the wing four times over the Normandy beaches. Thereafter, from a base near St Croix-sur-Mer, he and his men saw much action, and he himself had soon notched up his 28th kill, an FW 190 shot down over the Normandy bocage. In April 1945, Johnson was promoted group captain and given command of No 125 Wing, equipped with the latest Griffon-engined Spitfire XIVs. After VE Day, on May 8, he led the wing to Denmark. In the course of the war, he had never been shot down and had only once been hit by an enemy fighter, over France in August 1944. After Denmark, he was posted to Germany in command of No 124 Wing. 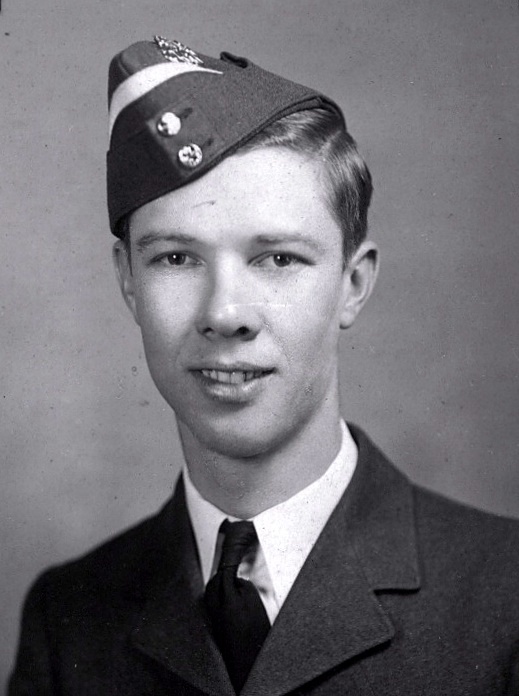 In 1947, having reverted to the substantive rank of wing commander (the price of peace and a permanent commission), he was sent to Canada to attend the RCAF staff college at Toronto. The next year he went on exchange to the US Air Force, and in 1950-51 he served with the Americans in Korea, before returning to Germany to command RAF Wildenrath until 1954. In 1957, once more in the rank of group captain, Johnson was transferred to the world of bombers, as Commander of the new Victor V-bomber station at Cottesmore, Rutland. He relished the opportunities to imbue bomber crews with fighter philosophy and to fly their powerful jet aircraft – and also to hunt with the Cottesmore and to hold hunt balls in the officers’ mess. After promotion to air commodore and a spell as Senior Air Staff Officer at Bomber Command’s No 3 Group, at Mildenhall, Suffolk, he received (on promotion to air vice-marshal) his final command – Middle East Air Forces, Aden. Johnson rated the latter command “the best air vice-marshal’s job in the Air Force”. After retirement from the RAF in 1965, he sat on company boards in Britain, Canada and South Africa. He also launched, and until 1989 ran, the Johnnie Johnson Housing Trust, providing housing and care for the elderly, the disabled, and vulnerable young people and families. Today the trust manages more than 4,000 houses and flats. He wrote several readable books, notably Wing Leader (1956), a wartime autobiography, and Full Circle (1964). With his friend and fellow ace Wing Commander P B “Laddie” Lucas, he wrote Glorious Summer (1990); Courage in the Skies (1992); and Winged Victory (1995). In addition to the decorations mentioned already he was awarded an American DFC, Air Medal, and Legion of Merit, and the Belgian Croix de Guerre and Order of Leopold. He was appointed CBE in 1960 and CB in 1965. He became a Deputy Lieutenant for Leicester in 1967, and was appointed to the Legion d’honneur in 1988. J E “Johnnie” Johnson died aged 85 in 2001. Operation Bodenplatte (Baseplate), launched on 1 January 1945, was an attempt by the Luftwaffe to cripple Allied air forces in the Low Countries during the Second World War. 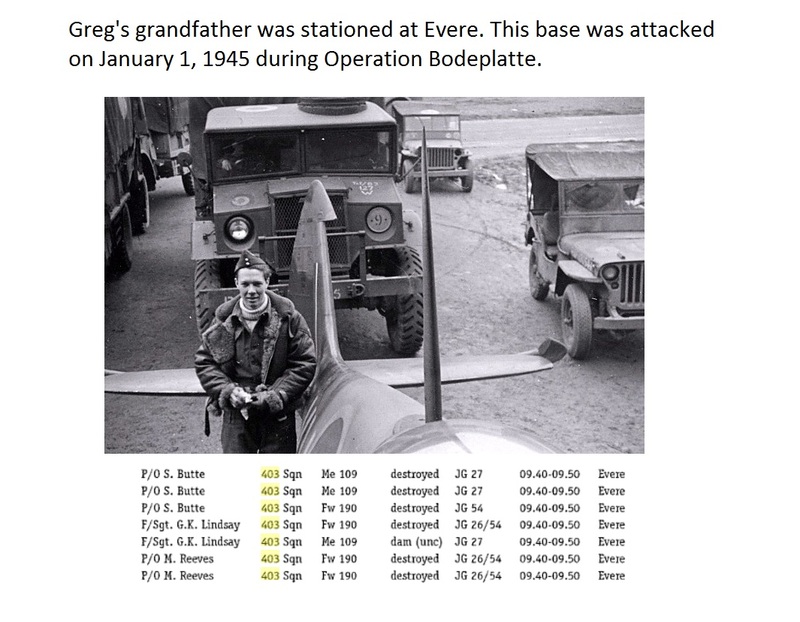 The goal of Bodenplatte was to gain air superiority during the stagnant stage of the Battle of the Bulge, to allow the German Army and Waffen-SS forces to resume their advance. The operation was planned for 16 December 1944, but it was delayed repeatedly owing to bad weather until New Year’s Day, the first day that happened to be suitable. Secrecy for the operation was so tight that not all German ground and naval forces had been informed of the operation, and some units suffered casualties from friendly fire. British signals intelligence (Ultra) recorded the movement and buildup of German air forces in the region, but did not realise that an operation was imminent. The operation achieved some surprise and tactical success, but was ultimately a failure. A great many Allied aircraft were destroyed on the ground, but these losses were replaced within a week. Since the majority of Allied losses were empty planes sitting on the ground, Allied aircrew casualties were quite small. Conversely, the Germans lost many Jagdflieger fighter pilots they could not replace. Post-battle analysis suggests only 11 of the 34 Luftwaffe’s air combat Gruppen made successful attacks on time and with surprise. The operation failed to achieve air superiority, even temporarily, while the German ground forces continued to be exposed to Allied air attack. Bodenplatte was the last large-scale strategic offensive operation mounted by the Luftwaffe during the war. Now you know his grandfather was there. 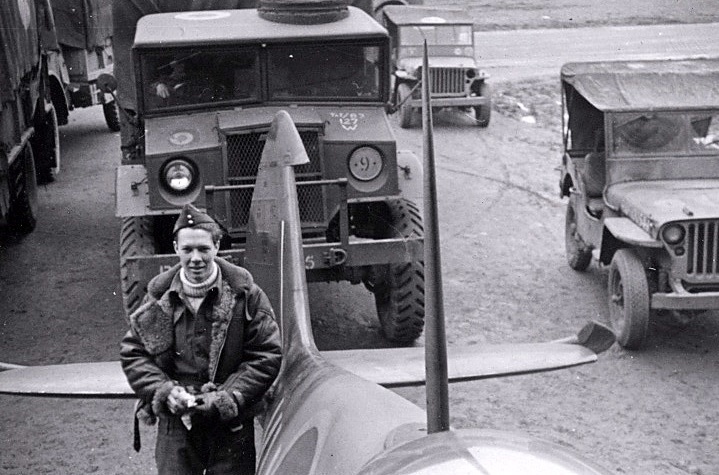 You won’t believe the pictures he has of RCAF No. 403 Squadron. You can click on each picture to zoom in. The best news is that we got the names also. F/O. James Leon Lanfranchi J/18918 R.C.A.F. On a beachhead patrol in the early morning when following combat with Fw 190 the engine failed. No. 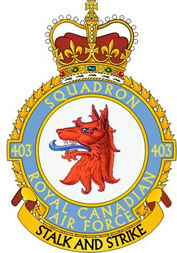 403 (Fighter) Squadron, Royal Canadian Air Force (RCAF), was formed at Baginton, Warwickshire, England on March 1, 1941. The first Squadron of the Royal Canadian Air Force (RCAF) formed overseas under the British Commonwealth Air Training Plan (BCATP). The letters KH identified it. after only 29 operational sorties. Through continual replacement and updating, the Squadron flew various models, MK 1 through MK XVI, of this very popular aircraft. The Squadron served in the Royal Air Force (RAF) Fighter Command and Second Tactical Air Force for over four years. By May 1945 , the Squadron had a record of 123 enemy Aircraft destroyed, with a share in seven more, 10 probably destroyed and 72 damaged with a share in one more. An equally impressive number of ground targets had been destroyed or damaged including 30 tanks, 50 locomotives and nearly 100 other vehicles. Sixteen Distinguished Flying Crosses (DFC), four DFC with Bar and one Military Medal were awarded to members of the Squadron, in addition to a number of Mentions in Despatch.